Drink enthusiasts, tiki culture fanatics and casual visitors to Polynesia will surely have at least a passing awareness of this staple island cocktail, but few know of its origins. The general consensus is that the Mai Tai was born sometime in the 1930’s or 40’s, with heated contention as to whether it was first shaken by the hands of Donn Beach or Victor Bergeron (better known as “Trader Vic”). One telling of the Mai Tai creation myth is that Trader Vic independently produced his own variation of Donn Beach’s more robust recipe, reducing the drink to a sublime blend of only a few high-quality ingredients: rum, orgeat syrup, orange curacao, simple syrup and a twist of fresh lime. A close recreation of the Trader Vic’s original Mai Tai recipe. (Note, however, that the original recipe used gold rum, instead of a mix of white and dark rum). Now, those of you who are familiar with what a Mai Tai tastes like may pause here. “There’s no pineapple juice on that list!” your inner dialogue may be screaming, and you would be correct. 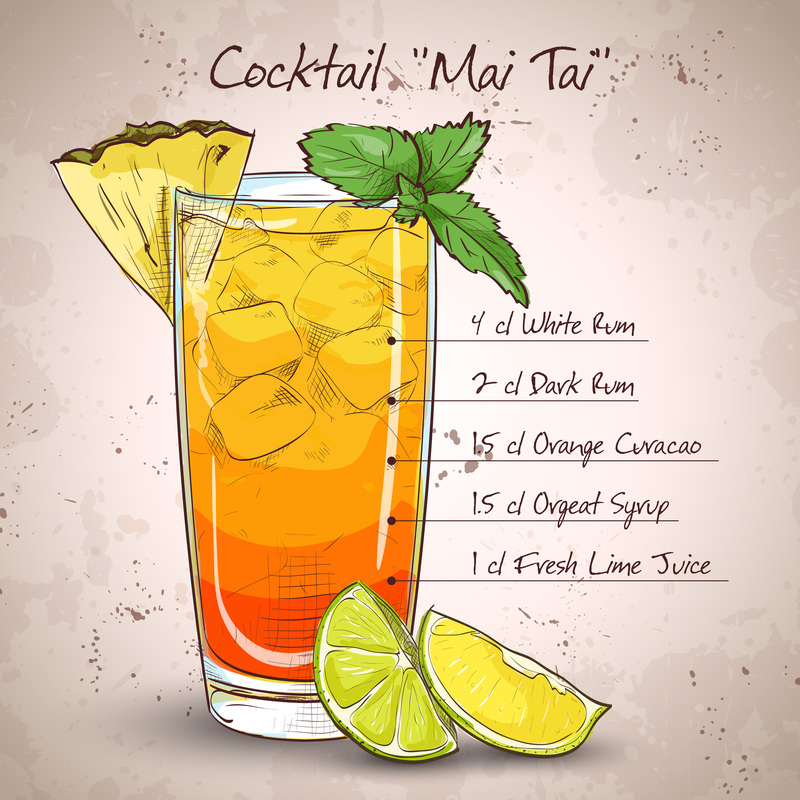 The original Mai Tai recipe (or recipes, depending on which version of the history books you read) never included fruit juices. The sweet and tangy mélange of fruity flavors garnished with a mini umbrella is a purely modern aberration. The turning point that ushered in the Mai Tai’s transition from an elegantly simple cocktail to a citrusy blend of juices and rums occurred in the 1950’s, with Trader Vic himself revising the recipe to broaden the appeal of the drink – a turn of fate not unlike George Lucas betraying his own masterpiece by re-editing the original cut of Star Wars with CGI that no one asked for. Nevertheless, that’s not to say the modern Mai Tai is a bad thing… it’s just different. Sometimes you’re really just looking for something sweet, pleasantly refreshing and highly alcoholic, and at those times, nothing quite scratches the itch like a modern Mai Tai, in all of its pineapple-infused glory, teeny-tiny umbrella and all. And, let’s face it, if you’re coming to Waikiki, you shouldn’t shy away from ordering a modern Mai Tai because a couple cocktail snobs on the internet told you it isn’t authentic. Nevertheless, it’s a saturated market and trying to figure out where to have a good Mai Tai (modern or classic) at a good price can be a challenge. 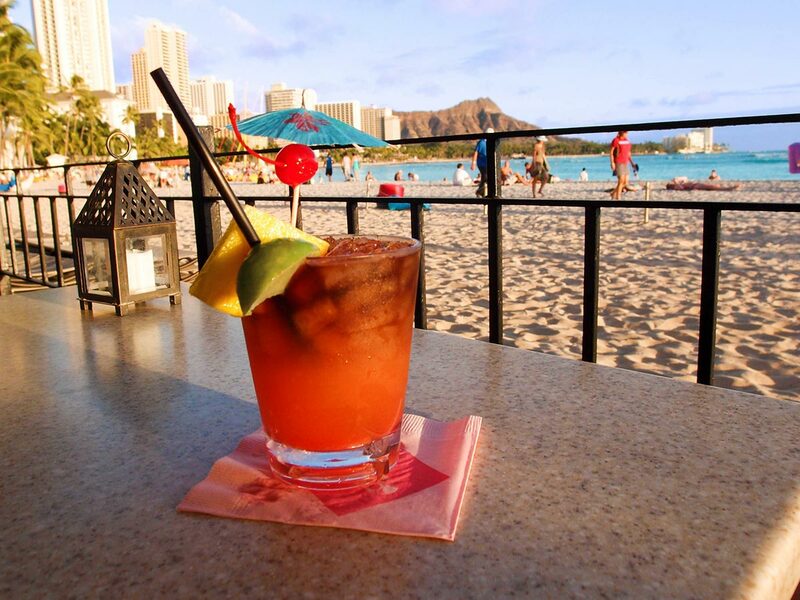 All in a days work – island cocktails overlooking Waikiki Beach and Diamond Head. We’re working hard at HawaiiActivities.com, slaving over one chilled glass after another, laboriously pounding back tasty alcoholic beverages to bring you up-to-date information on where to find the best Mai Tais in Waikiki. Our reviews in this series will be based on four key metrics. Flavor – Arguably what matters most when reviewing anything you put in your mouth. The Mai Tais we try will be considered based on individual flavors, smoothness and overall profile. Strength – Depending on the recipe and the bartender, there is a huge range of variation when it comes to cocktail strength, and this is especially true of the Mai Tai, which runs the gamut from “I don’t feel anything because there’s hardly any alcohol in this” to “I don’t feel anything because this is 99% alcohol and my entire face is already numb.” We want you to know what you’re getting into with these drinks. Price – Sometimes you want the best of the best: 17-year-old aged rum blended perfectly with top-shelf liqueurs and lime picked straight off the tree that morning, but everyone has a budget. Atmosphere – The best cocktail in the world doesn’t mean much if you’re forced to drink it in an uncomfortable atmosphere. Ambiance of the place that serves the Mai Tai will be considered as part of the whole experience. Be on the lookout for our first Waikiki Mai Tai review coming soon, in which we stop at Moose McGillycuddy’s, a down-to-earth local watering hole, to try out their happy hour signature. If you have any suggestions for places you’d like us to visit, please drop them in the comments section.